While driving around the neighborhood, I noticed my engine temperature gauge needle way above normal operating temperature, right against the red zone (gulp). A familiar sign of engine overheat. I pulled over to the nearest area where I could park and popped open the hood. Strangely, there didn't seem to be any signs of overheating. 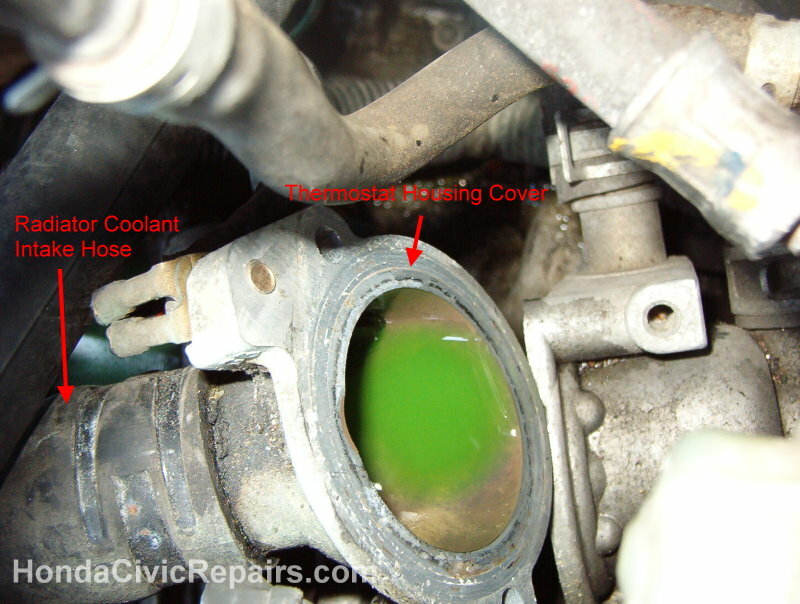 The hose that pushes the coolant from the engine into the top of the radiator was hot while the hose on the other end that brings coolant back into the engine was fairly cool. I figured my temperature gauge was faulty or the thermostat may need to be replaced. The thermostat sits right before cold liquid coolant enters your engine but prevents liquid to pass if the engine is operating below normal temperatures. It does this through internal wax that melts at a certain temperature. 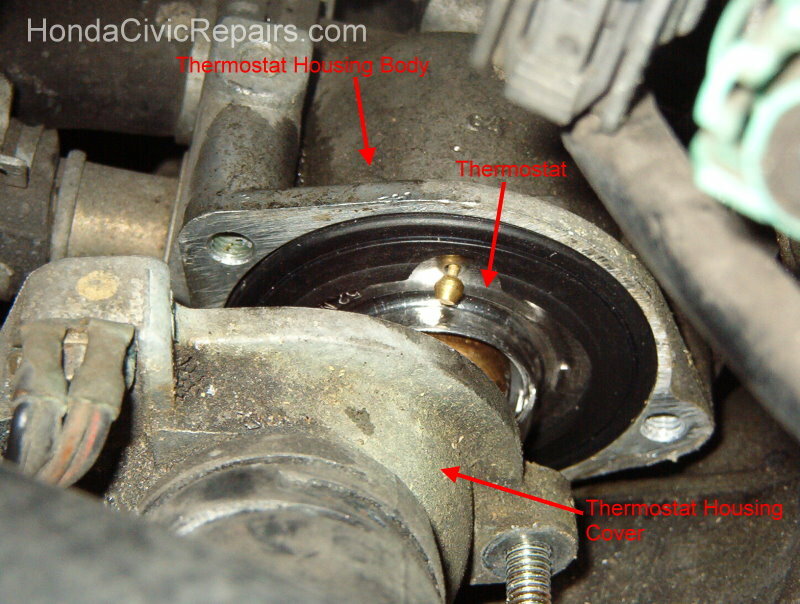 If the thermostat becomes faulty over the years and continues to prevent cold liquid to pass even when reaching normal temperatures and above, this could result in my engine overheating. After a few stop-rest-and-go sessions, the temperature gauge finally dropped along the center of the gauge and remained this way during my trip back home. I had a feeling that my thermostat might become a problem after a similar experience I ran into a few months ago. So this time, I figured it might be the best idea to replace it. 1. Placed a pan underneath the car to catch any liquid coolant spills. 2. Released and moved the clamp holding the intake radiator hose to get more clearance. 3. Unscrewed the 2 bolts holding thermostat using a 10 mm ratchet wrench with some extensions. 4. Removed the old thermostat. 5. 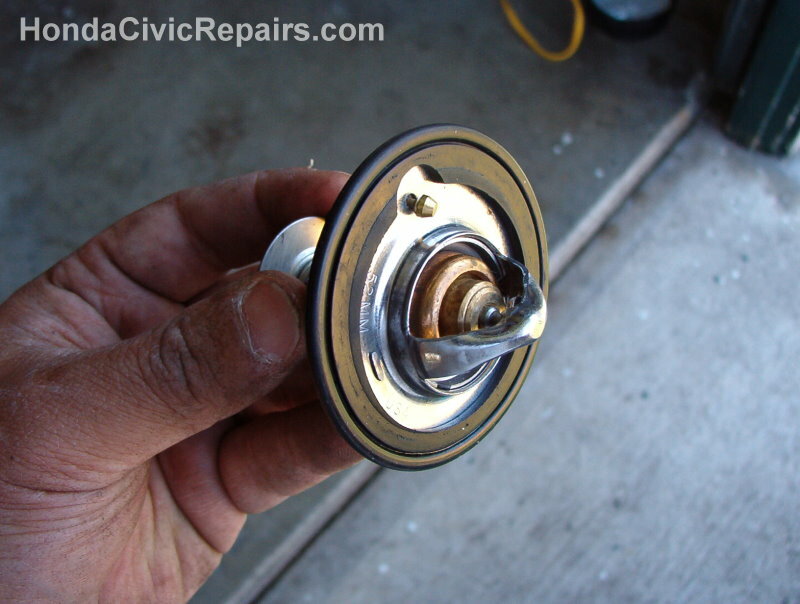 Removed the rubber seal from the old thermostat onto my new thermostat. 6. Made sure the pin indicator on the new thermostat was aligned to the top. 7. 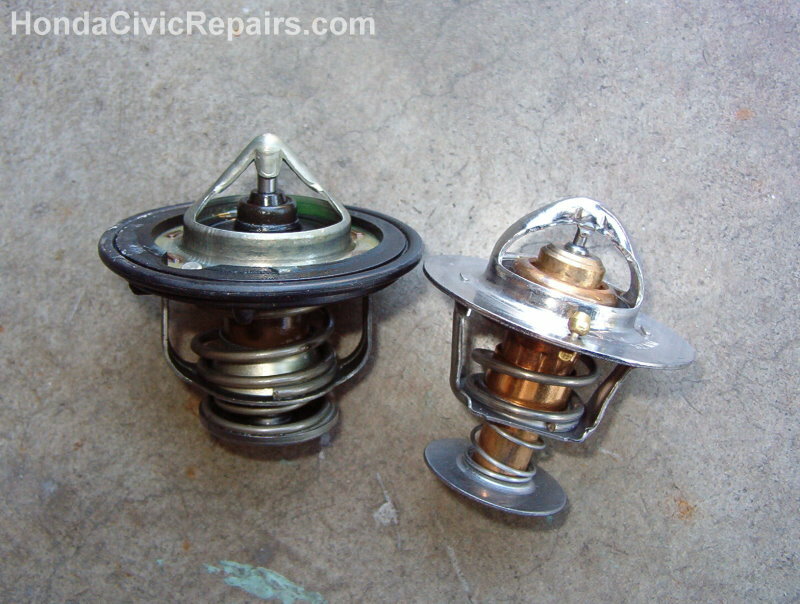 Correctly aligned and inserted the new thermostat into the thermostat housing. 8. Bolted the thermostat housing back with the 2 bolts at 8 lbs.ft torque. 9. Added and filled the radiator with new liquid coolant through the radiator cap. Started the car, and checked for any liquid coolant leaks. Everything looks good so if nothing comes up, then I must have taken care of this problem.